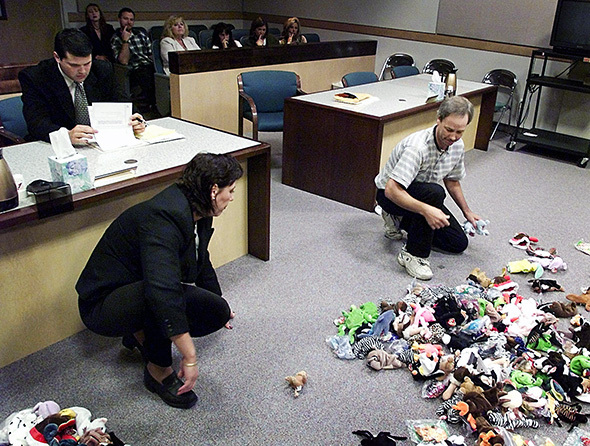 My kids went gaga over Beanie Babies in the ‘90s. The cute plush toys are filled with plastic pellets rather than conventional stuffing, which game them a more flexible feel. People began collecting them, then trading them like financial assets – the way some people treat baseball cards. At one point, Beanie Babies accounted for 10% of Ebay’s sales, and more than half of all American households had at least one at home. This collectible craze went viral. A magazine devoted to Beanies, Mary Beth’s Bean Bag World, sold over 650,000 copies on newsstands at its peak. “Investment grade” Beanies were priced at $250, with folks projecting that the price would quadruple in ten years. A divorcing couple couldn’t divide their collection themselves, and needed Court supervision as they divvied up Speedy the Turtle and Jabber the Parakeet. There’s a photo of the proceedings that went viral. The phenomenon ended, of course, and prices crashed. People who invested thousands of dollars lost thousands of dollars. Beanies can still be purchased, but as plush toys, not speculations. The founder, Ty Warner, is still a billionaire, although he was convicted of tax evasion in 2014. His company, Ty, Inc., stopped making Beanies at the height of the craze, and the prices didn’t jump, they fell. The bubble popped. Beanie Babies are a great example of a speculative asset. There’s no intrinsic value, except for the pleasure we get from a stuffed animal. $5000 “Raptors” are only worth what someone else is willing to pay, because they have no internal cash flow from which to calculate an intrinsic worth – only the cost of replicating them. People are comparing “Crypto-kitties” to Beanie Babies. Crypto kitties are cute, digital pets that people buy and breed using the crypto-currency “Etherium.” Etherium is like Bitcoin, a digital currency that is recorded using a distributed, cryptographically protected ledger. And the craze for the digital kittens – the internet is always and everywhere all about cats – is viral. The game launched just a couple weeks ago, and the most expensive kitten has already been sold for over $100,000. Trading in crypto-kitties now accounts for over 15% of Etherium traffic. This will end as all bubbles do, with prices reverting to their intrinsic level. The phenomenon may indicate the potential for crypto-technology, or it may be just another example of human fallibility. Personally, I prefer real kittens to the digital version. And “pet rocks” from the ‘70s didn’t indicate a bubble in minerals. It was just another fad that came to an end – as they all do, eventually. But fads and manias can continue a lot longer than people think. Just don’t risk any money on the latest craze that you aren’t prepared to lose.